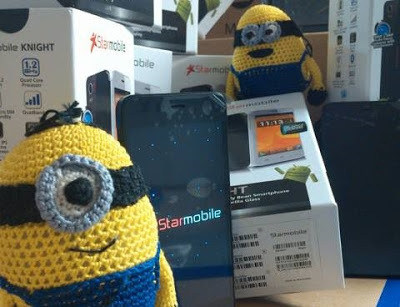 The minions has finally manage to get the awesome Starmobile phone, the Starmobile Knight which has been waited for a couple of months and now finally release this July 12, this is according to the official FB page of Starmobile. Just like we've shared before Starmobile Knight has a monstrous 18MP camera and 8MP autofocus front facing camera. Not only that it also has dual SIM, but not the ordinary DUAL SIM, DUAL Standby because Starmobile Knight is DUAL 3G in both SIM slots, what's more Starmobile Knight is also quad core and covered with expensive Corning Gorilla Glass that most iphones are equipped with. Lets not forget the 4.7 IPS HD resolution, totally a great attraction to tech enthusiast, and the best part among the rest is price of Starmobile Knight at Php11,290 SRP. As was shared above Php11,290 SRP | Available this July 12 in the Philippines nationwide. Lets just see about the reviews of this smartphone after the release, I will make sure to share AnTuTu benchmark and other benchmarking software results, and definitely make a review out of it, but not without the help of my fellow bloggers. Be sure to share your experience with Starmobile Knight after you bought it! 5. Hype buildup was so strong that the facebook group of Starmobile knight became from closed to secret after the launching of the Cherry Mobile Cosmos. 6. Nationwide Release is not simultaneous. Selected stores lang pala. 7. 3 months from product launching to release is so long. They should've had a product launching this September para sure na available in all stores nationwide. Yan ang tinatawag na, "wrong marketing strategy". Ganun paman hindi parin magpapatalo ang Starmobile. Let's just wait and see. Wait and See? eh ang cherry mobile pag mag launch ng phone, available agad sa mga outlets. Wait and See? after sales service ng starmobile here in cagayan de oro is so worse because they ship your item to manila. Kasi walang service center, outlet lang. Wait and See? I'd rather wait 30 min before opening ng Cherry Mobile Service Center. Tama! Ang ganda talaga ng SM Knight, superb camera's and HD videos, you can do whatever you want, superb multi-tasking, that's right if you go for iphone it will triple the price while in Knight you can get high quality that swak sa budget sariling atin pa..
tama k dyn brad..pti d2 sa laguna still wla p dn stock.